hiop compressor systems are designed for maximum performance and economy, easy installation and low maintenance. The twin screw Autorotor direct displacement compressors used in hiop kits are manufactured to the highest levels of quality with design and tight production tolerances providing reliability and effective boost at very low engine revolutions. This characteristic enables hiop to design it's systems to develop at least 75% of the supercharged engine's maximum torque below 2500 RPM. Competitor manufactured systems often have the compressor mounted a long way from the intercooler and inlet manifold. This results, attributed to lengthy interconnecting tubes, in pressure loss (ultimately power loss) and high induction noise. The hiop compressor system intergrates the compressor, watercooled intercooler and inlet manifold as one assembly, which is easily bolted onto the cylinder head. This design provides a very short induction path from the compressor to the inlet ports, resulting in instant engine response, low induction noise and low pressure drop. Unlike many competitor systems which mount the intercooler above the engine, an area of very high heat accumulation, hiop intercoolers are positioned lower in the engine bay to ensure maximum cooling. 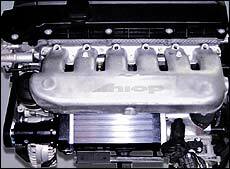 The hiop compressor is mounted on the inlet side of the motor, away from rising heat from the exhaust manifold. These details together with a high volume watercooler and seperate reservoir ensure efficient intercooling, even at very high ambient temperatures and at low speed city traffic conditions. The typical hiop compressor system can be installed, by any experienced motor mechanic, in 8 to 10 manhours. All parts for successful installation of the hiop kit are includsed.